Boxing and packing bikes is, let’s face it, a pretty thankless chore. Trying to wedge various prices of aluminium, carbon and rubber into a tippy box without something rubbing another thing into oblivion can be hard on a good day, and cat-kickingly frustrating on others, especially if you’re hungover and late for a plane. Ahem. A lot of riders swear by the cardboard boxes that bikes come packed in from the factory, and bike shops are always keen to get rid of them; they’ll even pack your bike for a nominal cost. It’s not always convenient, though, and schlepping a box with no wheels around an airport isn’t easy. On the hunt recently for a bag to replace aforementioned cardboard box, I stumbled across the Dakine Bike Roller bag. I’ve been a big fan of the brand for a while now; it makes good value soft kit that lasts well, and for around $400, it presented well on a value front. Intriguingly, it appeared to be able to be compressed in size when not in use – a big bonus for me. It’s a soft bag with a semi-rigid floor and base corners, lined with tarpaulin-like material and fitted with various colour-coded buckles. These coincided with separate pieces that are designed to slide over the forks and wrap around the front triangle, as well as a single separate wheel bag which complements a second wheel holder on the back wall of the bag. Packing involves removing the wheels, pedals and bars (not the stem, though) from my size-large 110mm-travel 29er dually, wrapping a cleverly designed front triangle pad with an integrated bar holder around the bike, and slipping the forks into the bag. An included tool wrap can hold your pedals and some basics, slipping into a pocket on the front of the forks. The rear wheel – a 29er with a 2.4-inch tyre in this instance – slides into the back wheelbag, and the rotor is shielded by a foam donut. The bike is placed into the back and the chainstays strapped down, while the fork bag clips into the coloured clips. The rear derailleur will in most cases need to be removed – I actually took the chain off for its first trip because I couldn’t make it all play nicely in the rear end of the box, despite the included pouch to cover the mech. Once you add the front wheel in its bag to the side of the bag and clip it in, that’s it! Job done. It’s a soft bag, so it deals with irregular bumps well enough, and the 8.2kg empty weight means that a 14kg bike will sneak in under the 23kg weight limit for economy class flights, even with a helmet in the box. It’ll easily fit an XL bike with the saddle dropped, though my 2.4-inch tyres were a tight fit in the wheel bags; bigger tyres than that might be a stretch. The Dakine has six handles, as well as a pair of sturdy inline skate-type wheels on one end, and it’s an easy bag to wheel around the airport; I didn’t find it to be unstable in any situations, even when manoeuvring around in lifts, juggling a second bag or hoisting it in and out of a car. The acid test, of course, is how it survives a flight… After four flights, a couple of bus trips, a stint in a ute and a train trip, the Bike Roller passed with flying colours. It certainly got grubby quickly, but nothing broke, tore, bent or got scuffed inside the box. The second time I packed it was easier than the first, which still only took 30 minutes from go to whoa. Once the bike was removed the Dakine can be folded down on itself to halve its height, too. Even though it means you still have a 140cm-long bag, it drops in height from 86cm to less than 40cm. It’s enough to get it out the way in your garage, or even in your hotel room when you’re on the road. MBA Says Whether the investment in a bike bag works with your travelling is really only something you can justify. 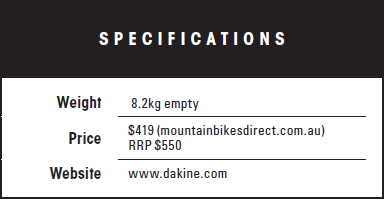 However, I’d suggest that the Dakine is a great bag for the relatively infrequent traveller with a valuable bike that’s worth looking after. Head to www.dakine.com for more.